It was a momentous film for many reasons, not only was it Peter Cushing’s first outing with Hammer Films, but it marked the start of the golden run of classic Gothic horror, for which they became famous around the world. 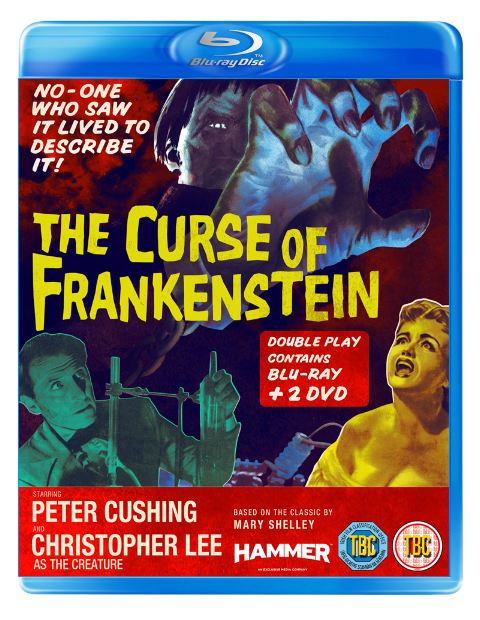 On 15 October 2012 Hammer Films, Icon Film Distribution and Lionsgate released Terence Fisher’s Gothic classic The Curse of Frankenstein, fully restored and in high-definition on Blu-ray, for the first time in its original “Academy” ratio of 1.37:1. This iconic British classic will be released on a 3-disc Double Play box set comprising one Blu-ray and two standard definition DVD discs. This release includes the infamous “eyeball” scene, which was originally censored but has now been fully restored. As well as an alternate version of the feature at the widescreen ratio of 1.66:1, the release also includes brand new documentaries and commentary track, multiple bonus extras and a stills show. The Curse of Frankenstein is a classic 1957 horror film by Hammer Film Productions, based on Mary Shelley’s 1816 novel Frankenstein. It was Hammer’s first colour horror film, and the first of their Frankenstein series. Its worldwide success led to several sequels as well as the studio’s versions of Dracula (1958) and The Mummy (1959) and established “Hammer Horror” as a distinctive and uniquely British brand of Gothic cinema. The film was directed by Terence Fisher and starred Peter Cushing and Christopher Lee in two of their most iconic roles for Hammer. Baron Victor Frankenstein is the archetypal aristocrat: well-read, cultured and arrogant. Beyond the sophisticated veneer exists a cruel, utterly unscrupulous man, obsessed with ambition. Determined to realise his greatest dream, to create life, he assembles a creature from organs gathered from various unwilling donors. The creature is successfully brought to life but the instability of the brain, irretrievably damaged, causes uncontrollable and violent spasms that result in indiscriminate murder… and it is the Baron to whom the blame is laid, with fatal consequences.